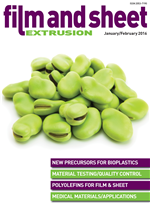 The January/February 2016 edition of Film and Sheet Extrusion is now available for viewing. Just click here to see the magazine in full, completely free of charge. Film and sheet industry news including GAF buying Icopal, Amcor acquiring BPI's subsidiary in China, Jindal relocating, European machinery sales on the up.